iOS (formerly iPhone OS) is a mobile operating system created and developed by Apple Inc. exclusively for its hardware. It is the operating system that presently powers many of the company's mobile devices, including the iPhone, iPad, and iPod touch. It is the second most popular mobile operating system globally after Android by sales. iPad tablets are also the second most popular, by sales, against Android since 2013. Originally unveiled in 2007 for the iPhone, iOS has been extended to support other Apple devices such as the iPod Touch (September 2007) and the iPad (January 2010). As of June 2016, Apple's App Store contained more than 2 million iOS applications, 725,000 of which are native for iPads. These mobile apps have collectively been downloaded more than 130 billion times. Major versions of iOS are released annually. 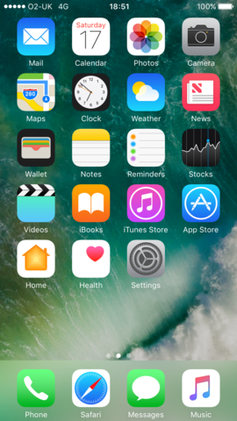 The current version, iOS 10, was released on September 13, 2016. It runs on the iPhone 5 and later, iPad (4th generation) and later, iPad Pro, iPad Mini 2 and later, and the 6th-generation iPod Touch. In iOS, there are four abstraction layers: the Core OS, Core Services, Media, and Cocoa Touch layers.